In the Sound Chair, the result of years of development by Ingo Boehme, you sit well protected inside the resonance body and the vibration spreads softly over your body into your fingertips. The backrest is strung with 30 plain and 30 spun strings that are tuned one octave apart. While sitting in the Sound Chair you are sitting in the resonance sphere of a monochord. You will experience the sound and vibration throughout your body: upper and lower back, thighs and even in the palms of your hands. The two armrests can be moved in different positions and the ball is used to rest the hand, giving the whole arm the sound massage. The back of the singing chair has two wheels to make the chair easy to manoeuvre. Tipping platform and arm rests supplied seperately. Size of sitting area: Seat 22" x 16", backrest 38.8" x 22"
In the Sound Chair, the result of years of development by Ingo Boehme, you sit well protected inside the resonance body and the vibration spreads softly over your body into your fingertips. The backrest is strung with 30 plain and 30 spun strings that are tuned one octave apart. While sitting in the Sound Chair you are sitting in the resonance sphere of a monochord. You will experience the sound and vibration throughout your body: upper and lower back, thighs and even in the palms of your hands. The "ears" of the chair create a special resonance chamber. The two armrests can be moved in different positions and the ball is used to rest the hand, giving the whole arm the sound massage. 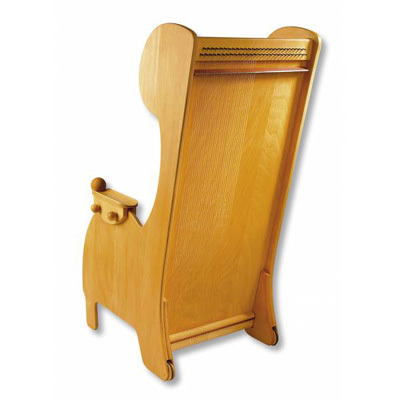 The back of the singing chair has two wheels to make the chair easy to manoeuvre. The back of the Sound Chair is strung with plain and spun strings which are tuned one octave apart. They can be tuned differently by using the additional bridges from the Monochord. This instrument allows an unlimited exploration of sound. The full body experience of sound and vibration allows you to relax and the massage allows you to become aware of many different tensions in the body which can be transformed into relaxation, realisation and change. This learning experience brings the outside feeling inside. Important: Because the experience of sound and vibration can activate strong emotional reactions it is highly recommended to be attentive to the client experiencing the sound chair. Tipping platform and armrests supplied seperately.